It doesn’t take a certified genius to understand that it’s a brave new world that we live in, meaning that even established companies will, on occasion, have to diversity their product offering to appeal to consumers in the ever-changing digital landscape. We may think of Hewlett Packard as one of the largest and most established PC makers in the business, but it seems that a change is as good as the rest, resulting in the company designing and manufacturing a backpack that not only acts as your standard carry-all, but one that sports a familiar looking exterior that abstracts away the fact that it has a number of battery charging features hidden within. 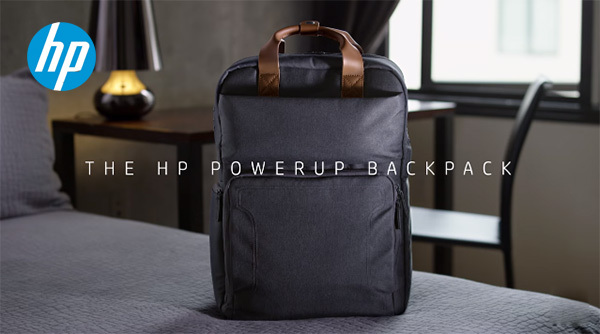 At first glance, the new HP Powerup Backpack looks very much like a very normal bag that a student or similar would purchase when going back to school, college or university. It features a large main compartment, as well as a smaller, but still spacious, pocket on the front of the bag. That front-facing pocket also contains a number of internal compartments for secure storage of personal items protected with a zip fastening. However, it’s when you learn that the bag also carries a high-capacity 22,400mAh battery where things start getting interesting and you understand the real power of this HP offering. That battery should be large enough to provide a full charge to most HP laptops, with the bag itself capable of carrying a portable machine with a screen of up to 17.3-inches in diagonal size. On a full charge, the built-in power pack can also deliver three full charge cycles to most tablets, and up to ten full charges to a smaller smartphone. 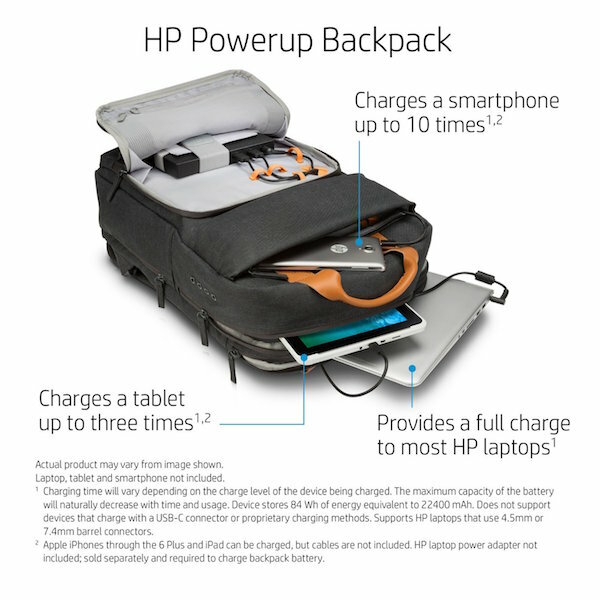 The interesting, and extremely innovative part of this charging service is that the Powerup Backpack also comes with a power priority system that allows the bag to deliver charge to devices in order of priority. For most of us who need charge on the go, that would probably be enough, but HP hasn’t stopped there with the clever tech. A built-in heat sensor also constantly monitors the temperature of the built-in battery and adjusts the charging speed accordingly. Similarly, a chip in the battery pack also detects the connected device type to provide it with the right current. It also packs 2 microUSB charging cables, as well as one HP laptop charging cable. To top it off, the canvas is coated to resist wet weather, but just in case the down pour is really strong, you can make use of the bag’s own raincoat. When you take all of that into consideration, the $199.99 price-tag starts to become more reasonable. The new intelligent backpack can be pre-ordered right now ahead of a September 14, 2016 launch.